Wide Receiver Terry McLaurin is one of the more ‘under the radar’ rookies in this year’s draft class. Despite having an excellent NFL combine on top of his skill set, he has still not been getting the hype that I feel he deserves. The former Ohio State Buckeye has legit speed, runs nice routes, is physical, and blocks well. Many mock drafts I’ve seen have him listed as a potential special teams guy, but he has big play ability and is someone I’m targeting later in my dynasty rookie drafts this year. Don’t get too excited, but the last Ohio State wide receiver that didn’t get the credit he deserved as a prospect was Michael Thomas. 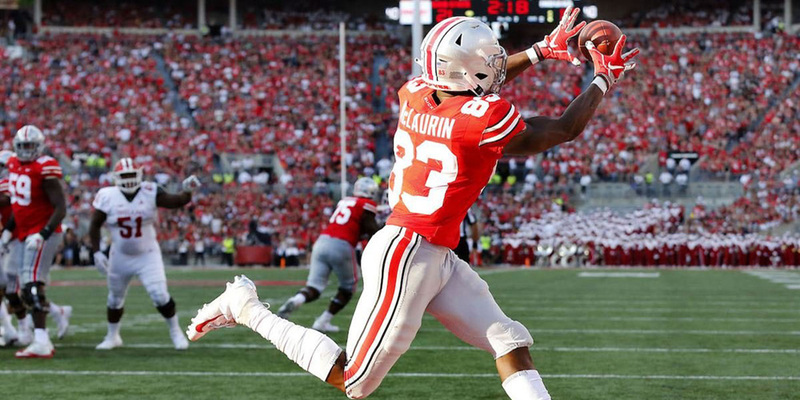 McLaurin was a team captain for Ohio State in 2017 and 2018. He was part of the team that won the National Championship in 2014 over Oregon. He also was part of the team that won the Big Ten championships in 2014, 2017, and 2018. McLaurin is someone that quietly had a very solid NFL combine. His speed was showcased in his 40 Yard Dash as well as his quickness in the 3 Cone Drill. Anything under 7.00 seconds in the 3 Cone Drill is as good as you’ll see in the NFL. A 126.2 SPARQ-x score is good for the 94th percentile, which is an excellent combination of speed, burst, and agility. If you’re into metrics, McLaurin should be someone that you loved after the NFL Combine. When it comes to strengths for McLaurin, one of the biggest things that stand out is his speed. He’s got excellent long speed but isn’t quite as good with his agility and short speed. During his final season at Ohio State, he averaged 20 yards per reception and had a knack for beating opposing corners vertically. His combination of size and speed makes for a nice receiver that can work the outside well. He runs routes well and he did run a variety of them in his time at Ohio State. He spent time working the outside as well as the slot. He caught nearly every target that was thrown his way, despite not having a ton of volume in his Senior year. Athleticism is a trait he has that I absolutely love for someone of his size. At 6’0″, he is fairly average with his height and has a solid build at 208 pounds. He isn’t afraid to get physical with opposing defenders and does a good job of making things happen after the catch. He is quick in the open field after the catch and does a fine job of finding running lanes. He isn’t afraid to take on defenders and has the size and physicality to do so. One of the weaknesses that stands out is his ball skills. He doesn’t always extend his arms to go out and high-point the ball. A lot of his catches you’ll see brought into his body more than extending and going out to get the ball. The reason I bring this up is that his wingspan isn’t great and neither is his catch radius. He does a good job of getting his feet in on the sideline, but I would like to see him extend more and use his hands. This isn’t a red flag, but it is worth noting given his metrics on his wingspan and the catch radius. He also isn’t the best at beating press coverage, but he has the quickness off the snap to make up for it. The combination of quickness off the snap with his long speed, makes it look easy for McLaurin to get himself open and beat defenders downfield. When it comes to NFL schemes for McLaurin, there isn’t one in particular that stands out as an ideal fit. If he were to land in a West Coast Offense, he would likely need to play in the slot as he isn’t a prototypical WR1. I would rather seem him in a Spread Offense where there is an established run game as well as a passing game. A more balanced offense would allow him to work the outside after the offense establishes the run, rather than a pass-heavy one where something like a vertical route may be more expected. McLaurin has the speed to take the top off a defense, and as someone with less than desirable ball skills, being opposite of a WR1 on a balanced offense makes sense. If he can establish a WR2 role on a balanced offense where he can play outside or out of the slot, I could see him getting more volume to be fantasy-relevant. In a balanced offense, the quarterback can play out of the shotgun more, forcing some slower defenders to cover receivers. If he gets slower linebackers covering him, he’ll be a matchup nightmare. McLaurin is someone I’ll be targeting in the third-fourth rounds of my dynasty rookie drafts this year. So far, he’s gone under the radar enough for this to be realistic, but I’d expect the price to go up as we get closer to the NFL Draft. As someone who excelled on special teams at Ohio State, I expect he’ll get some work there, so that is a slight bonus if your leagues give points for special teams production. As someone who may fall in the NFL Draft due to a large number of wide receivers who are more known than him, there’s a chance he may continue to go under the radar to an extent. Like many players for dynasty league purposes, landing spot will be a factor, but not entirely telling. As a player who can stretch the field and offer big-play upside, I don’t foresee McLaurin being someone who relies on volume for his production. I expect him to be someone who could break off a big play unexpectedly. If he lands in a spot where he could get some work in the slot, this will boost his draft stock for me due to expected volume. I expect he’ll likely end up being the WR3 on an offense when all is said and done, but he’s someone that I’m investing in his talent and upside. He may spend the first season on your taxi squad or buried at the bottom of your roster, but in the long-run, he’s the type of player I’m very interested in investing in the talent and skillset. Get a 50% match on your first deposit up to $100!